This is my commandment; love one another as I love you. As always this time of year, I need to ask you for your help and support. It is during this busy season that we act together to help care for the larger Church of the Diocese of Rockford. It is through your generous gift to the 2018 Diocesan Appeal that we can continue to bring the love of Jesus to those in need and teach the faith to young and old alike. That work takes many forms in many different diocesan ministries. Marriage preparation, promoting human dignity and respect for life, youth ministry, and vocations are just some of the diocesan ministries and services we support through this Appeal. What we give in support to the Diocesan Appeal comes back to help us in many ways! Our goal this year for our parish is $113,453. If every household who has financially supported us in the past would prayerfully consider giving $200, we could make our parish goal. Paid over 10 months that is $20 per month. Whatever we raise beyond this goal returns to our parish. Please join Saint Margaret Mary Parish in supporting the 2018 Diocesan Appeal. 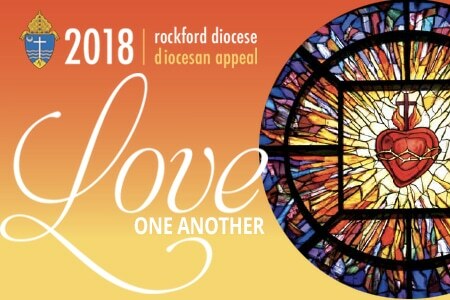 This year, if you planto make your gift by credit card or automatic withdrawal from your bank account, you can do so by visiting: http://www.rockforddiocese.org/donate or to the link on GiveCentral below to donate easily and securely. Through your gift, we can share the love of Jesus with our Catholic parish family and others throughout the Diocese. Thank you for your support as we participate in living the Church’s mission to be a witness of compassion and mercy to those in need.